On March 13, 2014, Rashad Owens sped away from an officer after being stopped for suspicion of DWI and drove the wrong way on a one way street, plowing into a crowd of SXSW attendees, wounding 22 and killing 4. On December 19, 2014, the victims and their families filed lawsuits against the two private companies that own the festival, SXSW Holdings INC, and SXSW LLC, the traffic design consultant SXSW hired to oversee the road closures, as well as Rashad Owens. With this deadly accident and recent lawsuit, one can only imagine how not only SXSW 2015 will be affected, but also how festivals and other special events nationwide will be changed to prevent future tragedies. How Will SXSW Events Be Impacted? SXSW planners have long argued the problem is non-sanctioned “splinter” events that draw over-sized crowds with free alcohol into downtown venues that aren’t equipped to handle that many people. More than 75 temporary permits for events were issued during the 2014 festival in Austin’s central business district — an area that already has nearly 200 permanent establishments with liquor licenses — and in 2015, the city is looking for ways to rein in this number. considering to further regulate the 2015 SXSW festival, but they have emphasized that public safety and the well-being of Austin’s residents and visitors are at the forefront of the decision-making process. A Change.Org petition started just this month calls for at least the rigid barriers be added by SXSW organizers. The petition currently has 579 signatures. 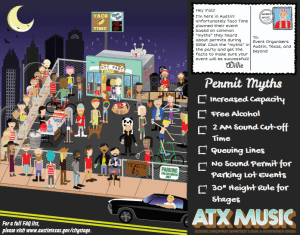 As of January 6, 2015, the city of Austin’s music and entertainment division released an interactive graphic showing the various do’s and don’ts for the festival to dispel any myths about acquiring a permit for the 2015 South By Southwest festival. organizers are hoping the graphic helps event planners and companies outside of Austin learn about the city’s regulations for the festival. What Steps Can Be Taken To Prevent Similar Tragedies At Other Events? – Use rigid barriers that can absorb and deflect vehicles away from massive crowds. – Prepare an emergency plan that addresses potential dangers facing workers, including overcrowding, crowd crushing, being struck by attendees, violent acts and fire. – Train all employees regarding emergency plans and also share them with local public safety agencies. – Most importantly, it cannot be stressed enough how important it is to have the proper event insurance coverage for whatever your event may be. Previous post LinkCoachella Music and Arts Festival 2015 Lineup AnnouncedNext post LinkDoes Your Nonprofit Need Insurance?